Geeta Goti is a well-known name in HR Consulting, Corporate Governance and Labor Compliance world. She has an overall 30 years of working experience with Government, Private Sector and NGOs. Her consulting experience is across various companies dealing with Agriculture, Airlines, FMCG, Banking, IT services and NGOs in countries like US, UAE, Sri Lanka apart from India. 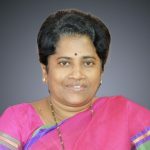 She is a fellow of Institute of Director (international body on corporate governance) and recently nominated by Government of India as first Woman Independent Director on the Board of National Small Industries Corporation Limited, a Public-Sector Enterprise under Ministry of MSME and a social enterprise Banka Bioloo an SME working in the area of Sanitation. She is one of the few professionals worked on the Prevention of Sexual Harassment of women at workplace under the Supreme Court direction much before the Act was passed. Currently she is nominated as a third-party member on the Internal Complaints Committee with Insurance, Manufacturing, Infrastructure and IT companies. She was also in the core committee of Women in Leadership (WIL) initiative of NASSCOM and Lead for HR forum of HYSEA leadership team. Geeta has been associated with NHRD Hyderabad chapter as Life member; and as Secretary in 2000. She is selected as National President by Confederation of Women Entrepreneurs of India (COWE) for 2016-17, an NGO working on Women Empowerment. She is an advisor to few NGOs working towards livelihood and entrepreneur development. Currently, she is mentoring Women in Manufacturing through the Womenergy Association of Incubators in Manufacturing (WEAIM). Geeta is certified behavioral assessor by Thomas Profiling and MBTI, has exposure in conducting assessment and development centers. With her counseling and training competencies, she has taken topics of contention with grit and ease to promote harmony at workplace. She is the founder of Sariga Initiatives working largely with first time entrepreneurs and SMEs in designing work processes adhering to labor compliance. Sariga’s purpose is to support businesses in managing and enabling entire gamut of HR life cycle from Hire to Retire, with cognizance of the compliance involved in running a business in India and the growing need to be equipped for the Future of Work.